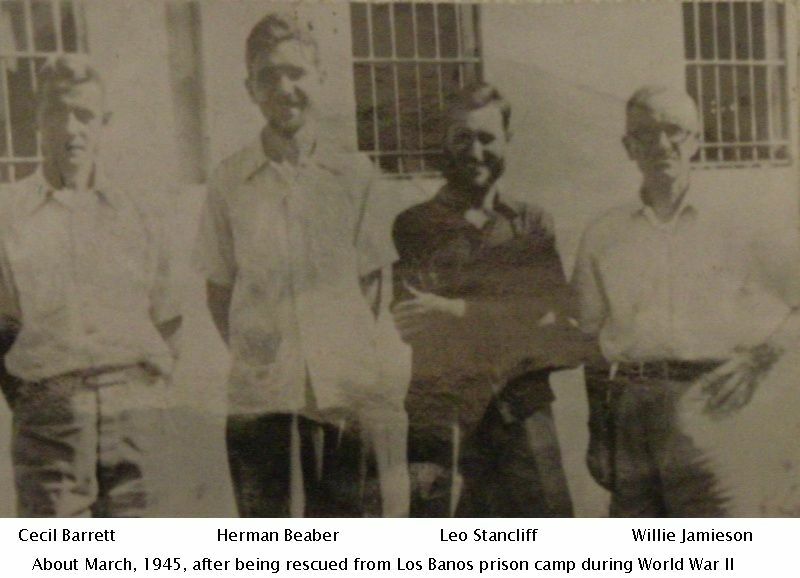 In the previous post, I described the rescue of the 2,122 internees held captive in Los Banos camp on Luzon, P.I. and stated that the operation followed the nine principles of war. In all military academies, this concept is taught and many of the students use the acronym MOSSCOMES to remember each one. One POW, on the way back to the Allied lines spotted an Air Force Wing flying overhead. He looked up and said, “Hundreds of planes arrived just like they (FDR) promised in 1942 – but, oh my God, they are so late!” Thankfully, by the powers that be, Gen. Swing used his youthful training to plot their escape. This mission is still discussed in some military schools todays. M – Mass – concentrate overwhelming combat power at the decisive place and time. This way, even smaller forces can achieve the desired results. O – Offensive – To seize, retain and exploit the initiative. Take the offensive position and keep going. S – Surprise – Strike the enemy at a time, at a place or in a manner for which he is unprepared. Surprise can come in the form of rate of speed, the size of the force, the direction by which the attack is made or deception. S – Simplicity – Prepare clear, uncomplicated plans and use clear, concise orders to ensure understanding. C – Command – Unity of command for every objective ensures unity of effort under one responsible commander. O – Objective – This is the ultimate purpose of war; the destruction of the enemy’s ability to fight. M – Maneuver – Movement of your forces in relation to the enemy so that you retain the upper hand. To place the enemy in a position of disadvantage. E – Economy of force – Use most of your power for the main objective, then use a minimum force for the secondary efforts. NO part of the force should be left without a purpose. S – Security – Having a solid security, you reduce the chances of hostile acts and surprise. You want nothing to distract your force from it’s initial purpose. More current news – The town just north of me here in So. Fla. once again finds time to honor our veterans. The Ascension Lutheran Church will honor the “Four Chaplains.” The clergymen of different faiths whose transport ship, theDorchester was torpedoed 3 February 1943 gave their life jackets away to servicemen and went down with the ship together. A commemorative bench is being placed in Veterans Memorial Park in their honor. 23 February 1945 demonstrated the result of teamwork between General Swing and his troops, the Filipino guerrillas and the intelligence supplied by an escapee of the interment camp of Los Baños, Peter Miles. 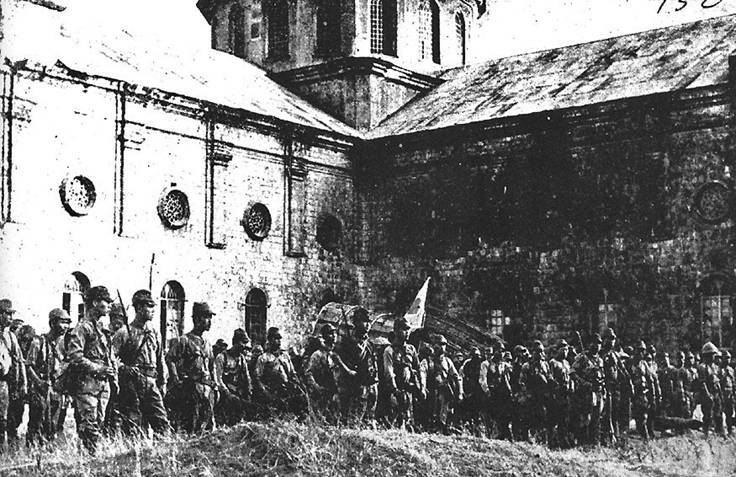 The man’s photographic memory gave a detailed layout of the prison and the exact sites of the guards and armaments. Mr. Miles had memorized the strict regimental daily routines of the Japanese and the specific times when the guards changed shifts and had their exercise periods, which would put them a safe distance away from their weapons. By this time, Everett “Smitty” Smith was an NCO and when I’d asked him many years ago if he was part of the Los Banos Raid, he said, “No, I was occupied somewhere else.” As best as I can find in my research, he was busy with the rest of the 187th near the 457th parachute FA Battalion that was commanded by Captain Flanagan. (The captain would later become Lt. General E.M. Flanagan, author of many WWII historical books.) Although Smitty wasn’t at this dramatic feat of the 11th Airborne Division, it deserves any and all the attention it gets. It is an operation that anyone associated with the division remains proud of to this day. The guerrillas provided intel and also guided Lt. Skau’s reconnaissance platoon into position under the cover of darkness. The army did help supply them with radios, ammunition and food, but the loosely organized groups also later stole the 11th’s supplies, calling it a justified gift. First Lt. John Ringler was in charge of those troopers who would drop 900 yards from the camp. They made their jump at approx. 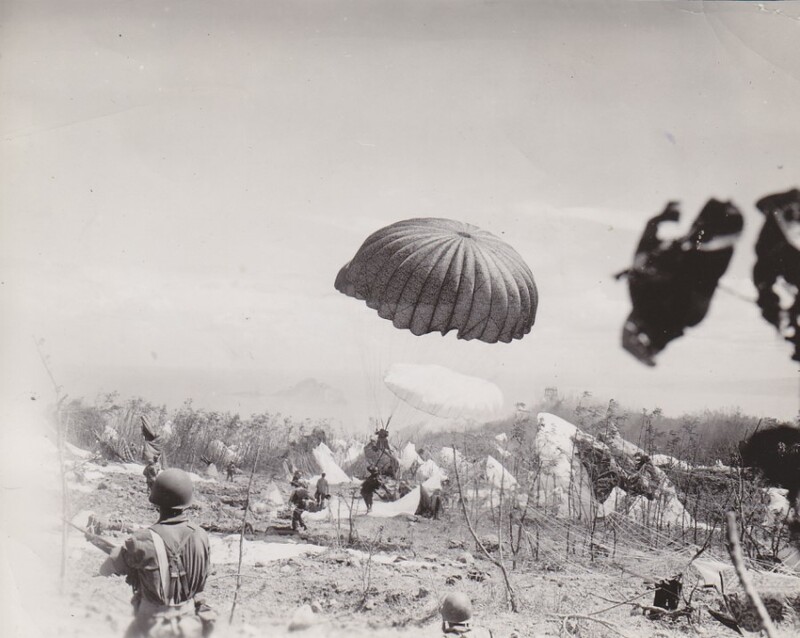 500 feet instead of the usual 700-1,000′ since the drop zone was so small and the men would have less exposure time. They made three V’s-in-trail by the nine Douglas C-47s from the 65th Troop Carrier Squadron, 54th Troop Carrier Group. Some of the men ran across open fields to achieve their assigned positions. Ringler and his company went down a riverbed from the northeast (photo) while others came from the south and southeast. 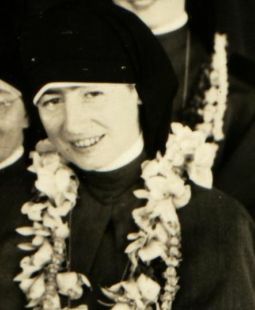 Major Burgess went across Laguna de Bay with the amphibious vehicles as the main attacking force. The noisy amtracs slowly made their progress to shore with hopes the enemy had not heard their arrival. 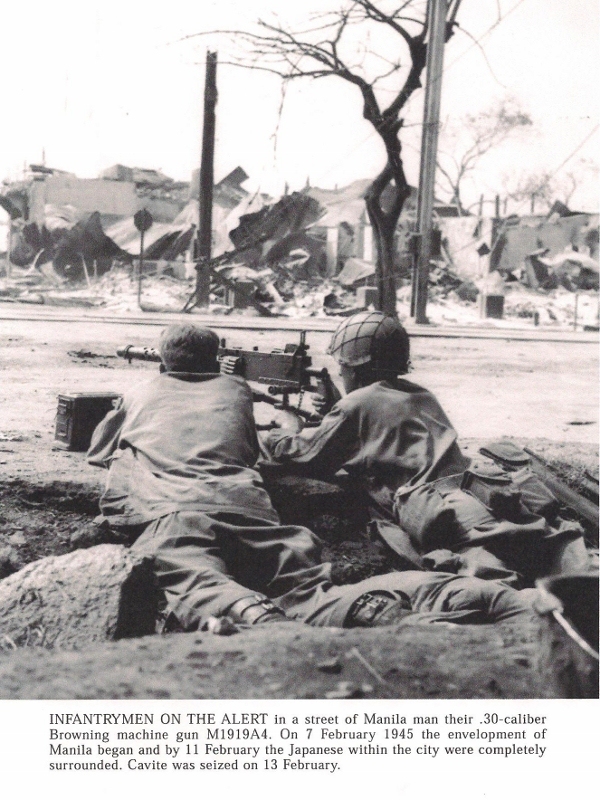 Once on the beach, the 457th Parachute Field Artillery Battalion dismounted at San Antonio to defend the area. 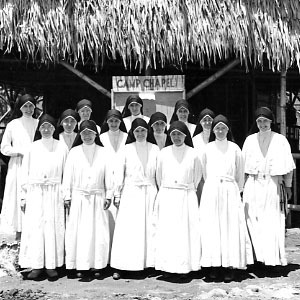 On land, Lt. George Skau and his 31-man platoon infiltrated with the Filipino guides and banca crews. (a sailing vessel usually used for fishing and trade) Once the men eliminated the tower sentries and guards, the soldiers attacked and entered the camp. The internees ran into their barracks or ditches when the firing began. One man said that at the start of the war, they were still using WWI materiel, so when they spotted the domed helmets of the troopers, they believed the Germans were there to help the Japanese. When the reality of the situation became apparent to them, the G.I.s had over 2,000 excited and hysterical people to contend with, but many of them were unable to walk. Every moment was crucial as the enemy could arrive at any minute. 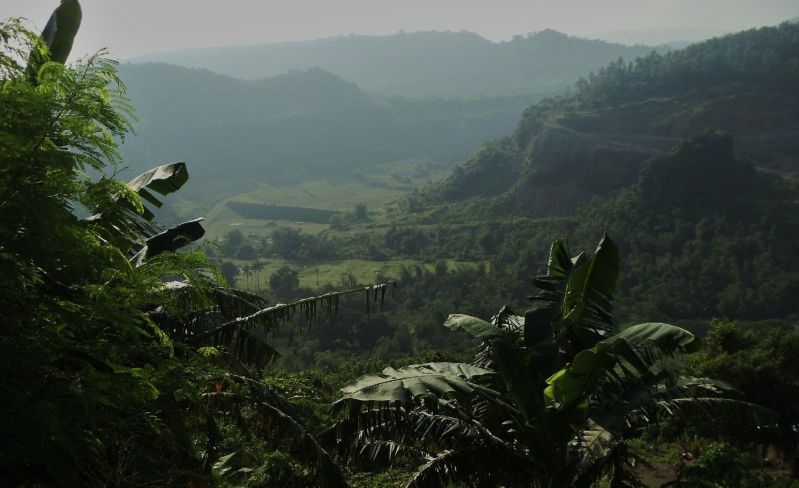 Sometime during this period, the guerrillas faded back into the jungle. 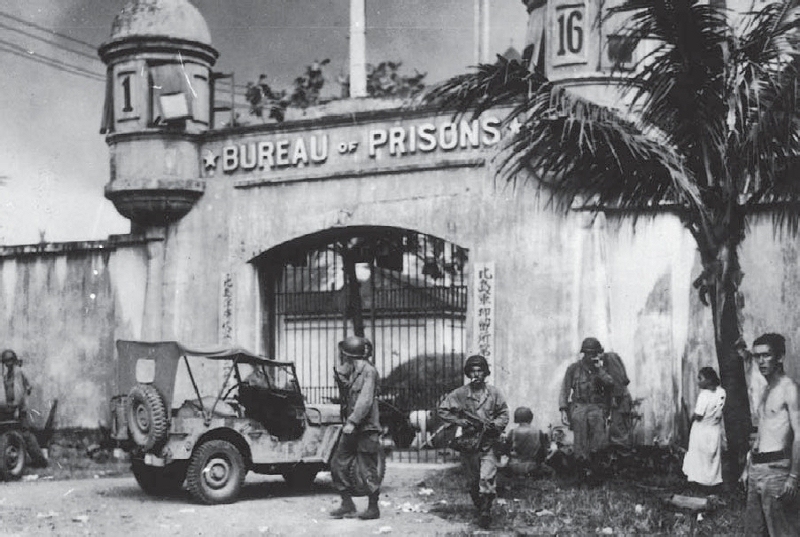 The 11th Airborne’s G-4 amassed 18 ambulances and 21 trucks to take the 2,122 internees to the New Bilibid Prison, where they would remain for a few weeks before being shipped home to the U.S.. They had been prisoners for three years. The Japanese supply warrant officer, Sadaaki Konishi, who actually ran the camp, was able to escape the American raid unharmed. He, along with others of the enemy and the YOIN (Filipinos that were pro-Japanese – makapili) continued to kill and burn the homes of the surrounding population. He was later accused of six counts against the laws of war, tried and found guilty of five charges. Sadaaki Konishi was executed on 17 June 1947. 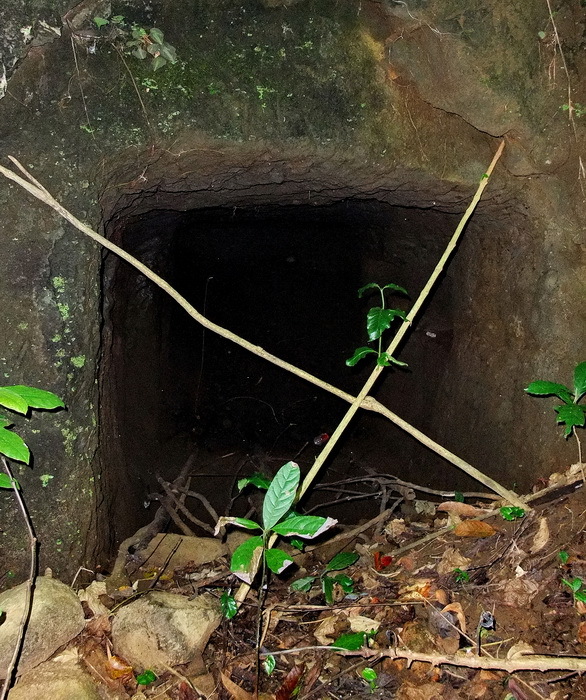 The stretch of blockhouses and pillboxes and tunnels, known as the Genko Line were filled with every imaginable weapon available from the Japanese arsenal. Along mountains, under fields and connecting the rolling hills lay the traps of heinous sorts silently in wait for any or all of the troopers. The 1,200 two and three-story blockhouses entrenched with at least 6,000 enemy soldiers that lined the southern edge of Manila. A massive feat of ingenuity. The size of some of these tunnels amazed me, large enough for a boat or plane and some appear too small for a human to hide. 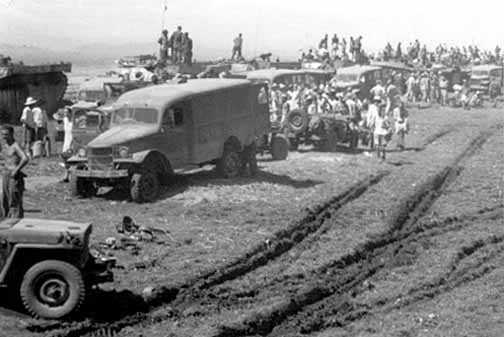 Also wanted to remind the reader that on You Tube – type in – Nasugbu landing 1945; Allied Forces Land In Japan (1945) and 11th Airborne to see quite a number of actual video footage from the war. Thank you all for your loyalty and responses. As the 11th airborne was switched back to the Sixth Army, General Swing received orders to destroy all forces in Southern Luzon, specifically at Macolod and Lipa, along with clearing Route 19. The division had not received many replacements so they were even smaller in size than before; the 158th Regimental Combat Team was attached to partially compensate. The Manila-Batangas highway ran north to south and was essential to secure the port of Batangas for future landings. On top of all this, Swing was ordered to destroy enemy forces in Ternate. 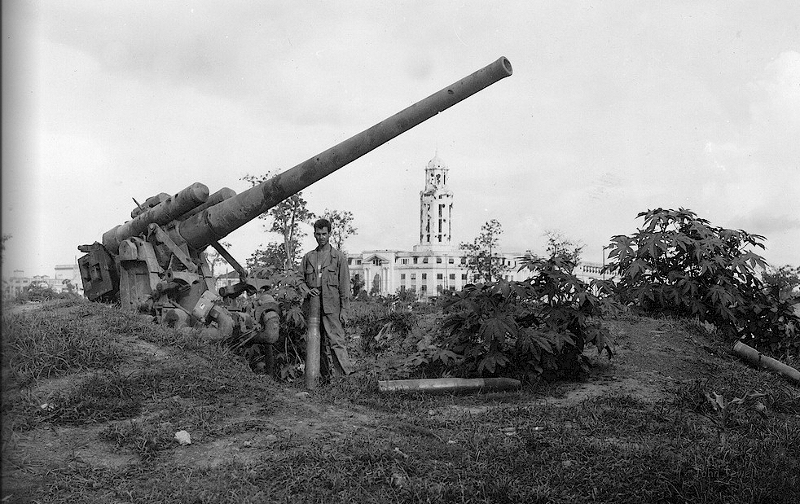 (Southern shore of Manila Bay) None of his men had the privilege of being in reserve, but the general had the utmost confidence in his men to succeed. 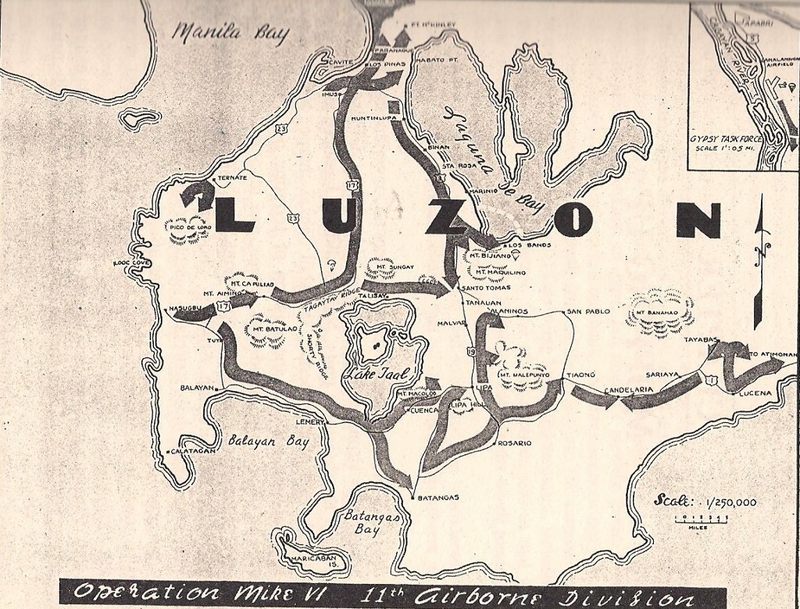 His plan – Put the 187th on the right, going through the neck between Lake Taal and Laguna de Bay. The 158th on two other routes and the 1st of the 188th to Ternate. 22 February 1945, the Cairns Post reported that the 11th Airborne had been seen south-east of Laguna de Bay and surrounded an enemy unit at Mabato Point and compressed them into an area of 1200×800 yards. 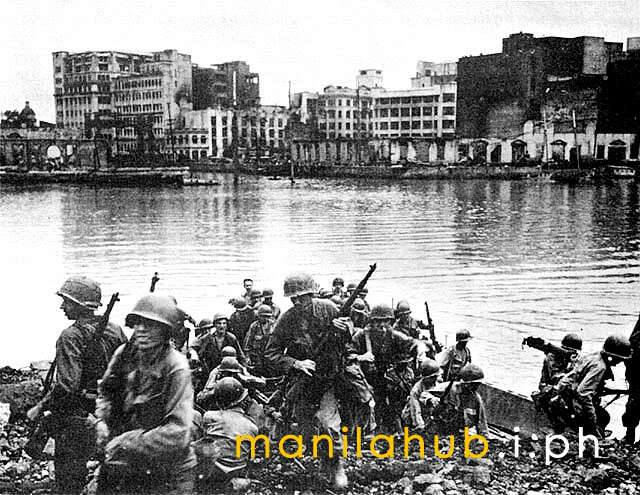 From there, they traveled through Alabang to Muntinupa where the Japanese were attempting to evacuate their troops. The 11th was relaying back reports of finding natives hacked to death by bayonet or burned alive by the enemy. The 187th, with the675th Glider Field Artillery Battalion attached bivouacked near Mount Sungay and sent out daily patrols to the east. G-2 (Intelligence) knew the Japanese Fuji Force was out there and needed to picture the enemy locations. While the troopers fought ground battles, the engineers were carving out the mountain. The sheer cliff was almost vertical, but the roads being built was imperative. Assistance with this article came from Rakkasans by Gen. E.M. Flanagan; the VFW; 2eyeswatching.com (pix only); The Angels: History of the 11th Airborne Division by Gen. Flanagan; Pacific War On-line encyclopedia & WW2 Database – all I wish to thank for their diligence in recording history. Current news – The Purple Hearts Reunited organization will return Cpl. George Hemphill’s medal, which he had sent home during WWII for safe keeping and never saw again. A man in Fla. had somehow purchased the award in 2000 and it wound up in Vermont with yet another man. Hemphill, now 90, was hit with shrapnel Sept. 11, 1944 from an enemy sniper. Also – From today’s wars – Gabe, the mine sniffing War Dog has returned here to South Fla. after 13 months of service in Iraq. Gabe,a golden lab retriever who was originally a stray rescue, received a medal for his 210 combat missions. In all – 40 awards and coins for his service. He and his handler, Sgt. 1st Class Charles Shuck will now spend a year doing public appearances. The capital region of the Philippines went an invasion from Brunei, then the Spanish landed in the 15th century. It endured several Chinese revolts, a British occupation, a Sepoy mutiny and their own revolution when the Americans showed up. 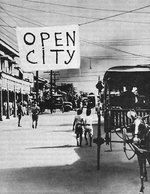 In 1941 General MacArthur declared Manila an Open City and in 1942 the city fell to Japan. Japanese General Yamashita never had any intention of defending the capital city. It was a vast area of highly flammable buildings and far too populated to feed. From his command post, 125 miles north of Manila, he ordered Admiral Iwabuchi to remove all of his troops from the city – he refused to comply. Instead of retreat, he took thousands hostage and all communication between the two men ceased. Japanese Gen. Yokoyama estimated the American strength in Manila to be little more than a regiment and the fighting continued. 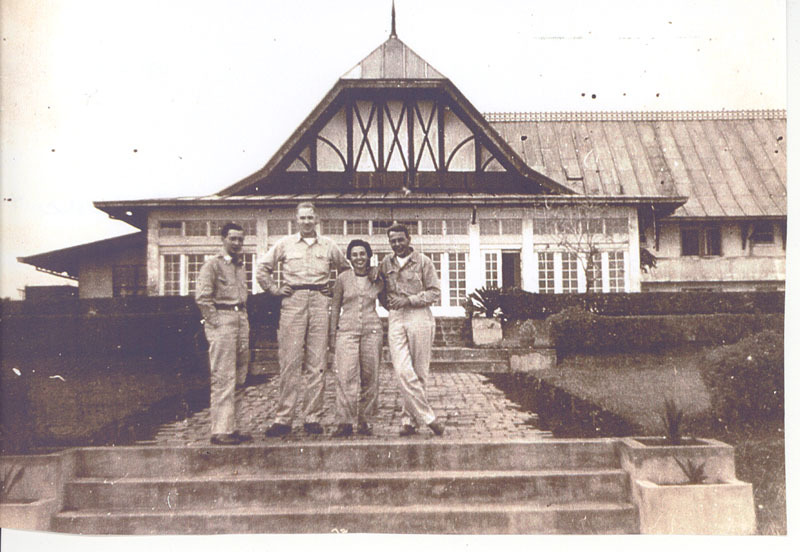 18 February 1945, an unusual situation was discovered in Manila when three soldiers were returning to their headquarters in a mansion set on Dewey Boulevard South. A few blocks away, the troopers entered a house only to discover three Japanese men in robes and talking while they drank their tea. Somehow, they had been operating out of that house without realizing that the American HQ and General Swing were so close. It seemed incredible they were not discovered before. The three men were killed trying to escape the building. The commander of the 188th regiment turned his unit over to Gen. Pearson, now commander of the 187th, and they were incorporated into the Task Force and set out to attack Mabato Point. This zone sat two thousand yards south of Fort McKinley and held the Japanese Southern Forces Abe Battalion on the northwest shore of Laguna de Bay. This position gave the enemy an excellent vantage point of observation and fields that could be set on fire. As with the rest of the Genko Line, this area had been prepared by Japanese and Filipino workers since 1942 and had fortified tunnels. G-2 estimated about 800 of the enemy were hold up on Mabato. Pearson put the 187th traveling along the railroad tracks and other regiments and battalions to other areas. When each unit was set, mid-morning on this date, Company B of the 187th launched the attack. The 457 Parachute Field Artillery was there to support with their pack 75s. Later that afternoon, air strikes were called in because the enemy was so well defended. When napalm was used, the fires used up so much oxygen that the enemy soldiers in the tunnels began to suffocate. 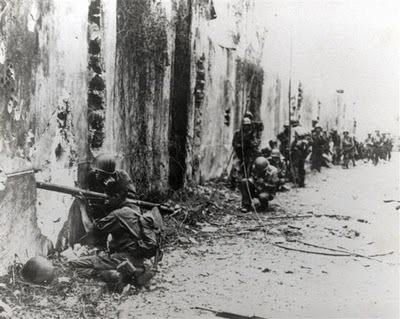 19 February, the Task Force struck again, but were having difficulty due to Japanese mortar fire. Finally, the mortar observers were located where they hid in the trees and sharp shooters took them out. 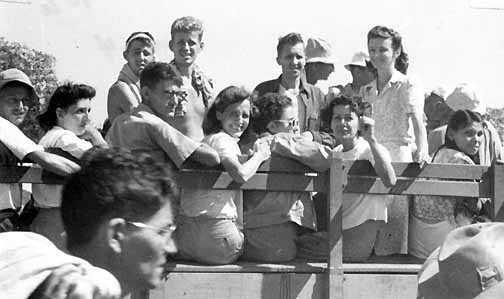 A Japanese medical officer surrendered and through a Nisei interpreter informed Pearson that there were about 400 more Japanese in the area. A Filipino volunteer went to the enemy with a message of truce, giving one half hour of cease fire time for anyone to surrender. The end result has conflicting stories, but the fighting did continue. The surviving 15 officers of Abe Battalion were marched by their commander to the Point and committed hara-kiri. 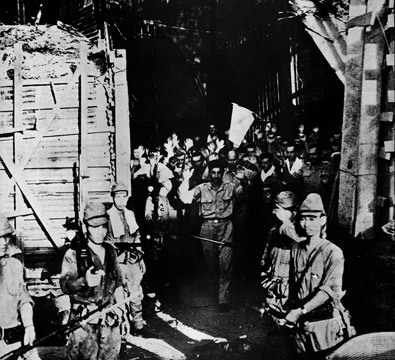 By 21 February, all resistance on Mabato Point had ended, but the Japanese were far from defeated in the Philippines. Photos and data with the assistence of Rakkasans by Gen. Flanagan; The U.S. Army; Wikipedia & Manila Hub. Thank You. 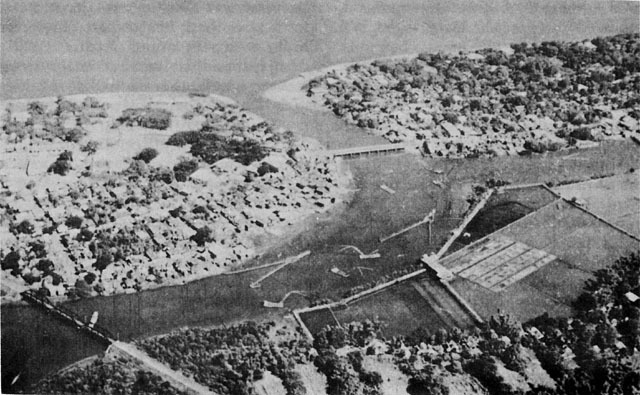 Manila Bay was extremely important for shipping traffic, regardless of who was in control and the island fortress of Corregidor sat mid-way. The need to re-conquer the “The Rock” was imperative to the Allied effort. 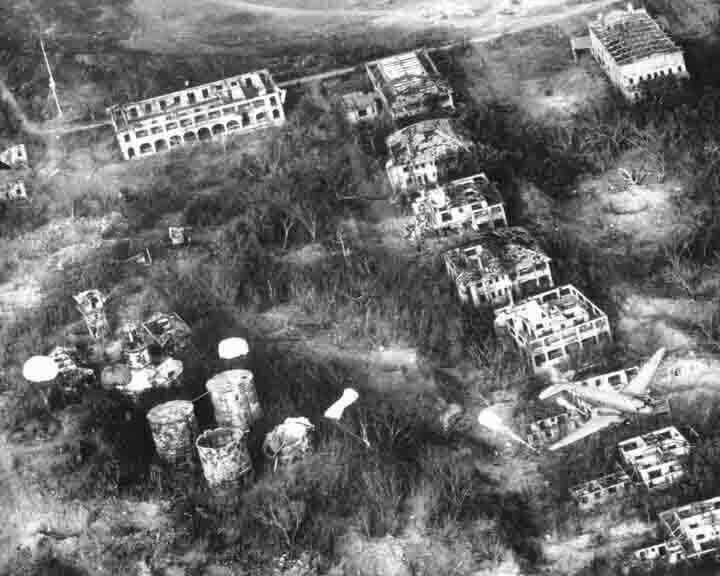 The Air Force began its attacks 22 January and by 16 February had dropped 3,125 tons on the three-tier island. 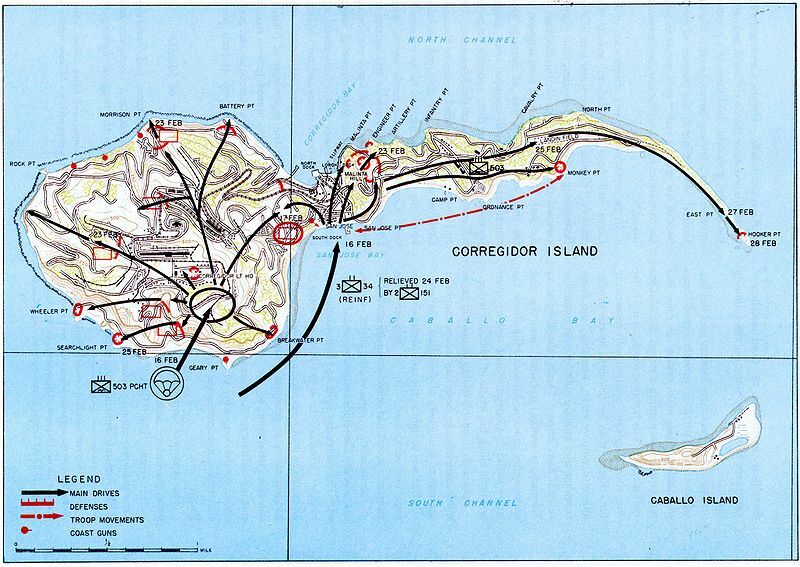 That same day, 24 B-24s hit known gun positions and 11 B-25s hit antiaircraft guns and the south coast while 31 A-20s strafed Caballo Island, a mile to the south. 13 February, Naval bombardment began mostly on the north side of the island and mine sweeping in the waters. On 16 February, the 3d Battalion of the 34th Infantry, part of General Krueger’s Sixth Army, landed on the south shore after it was also bombed and strafed. The 503d was not originally a part of the 11th Airborne Division (Eighth Army), but was at this stage attached and therefore I believe they deserve mention here. So, it was also on the 16th that they boarded their C-47s on Mindoro to parachute in waves on the top and very dangerous area of Corregidor. At 0833, 3 minutes behind schedule (amazes me how they keep track of the seconds and minutes during a war), the first wave jumped and only encountered minimal enemy rifle and machine gun fire. They had put themselves down right at the Command Post, killing the Japanese general and destroying the enemy communications center. This immediately caused some confusion among the Japanese. After securing Topside, they were able to give support to Bottomside and achieve contact. It appeared that Japanese General Rikichi Tsukada and what was left of the Kembu Group had been caught off guard. No trooper drowned during this jump, despite rumors to the contrary. The 34th Infantry Regiment established a beachhead at Black Beach and they proceeded to block both the north and south entrances to the Malinta Tunnel, consequently trapping that portion of the enemy. 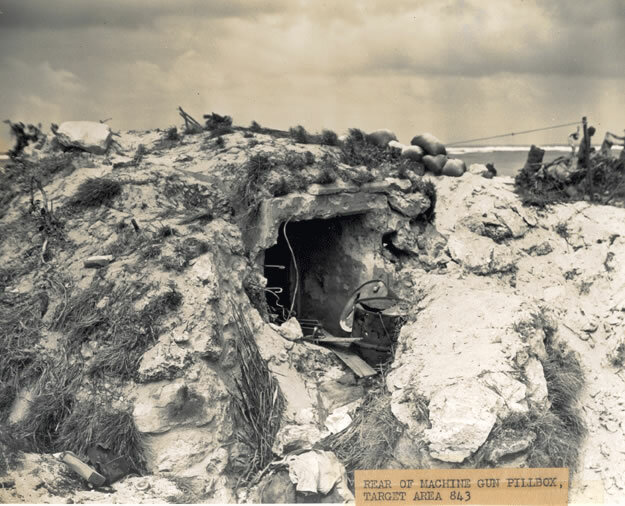 Tons of ammunition were stored in the tunnel and the 600 foot plateau was mined. 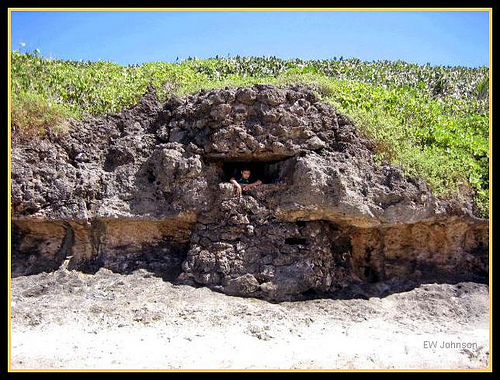 All the men fought cave to cave and repelled banzai attacks as the soldiers fighting on the mainland were doing. 21 February, at 21:30 hours, Malinta Hill erupted in a massive explosion as the entrapped Japanese army blew themselves up. 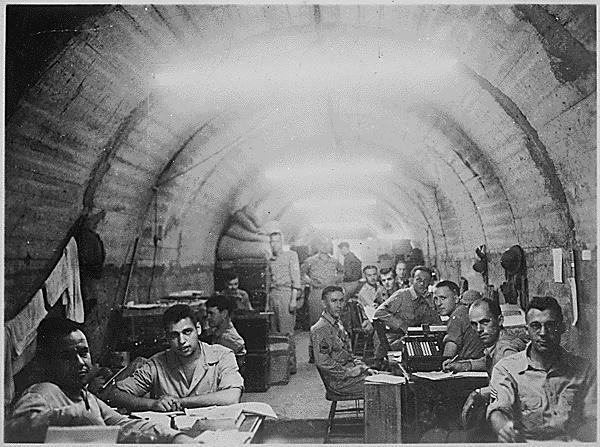 The U.S. soldiers then sealed the tunnel. 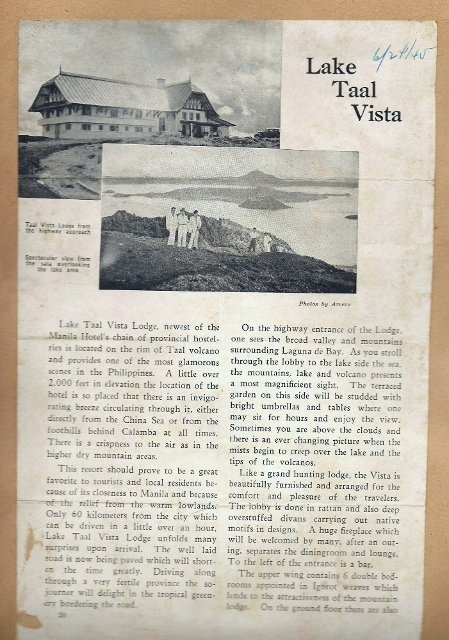 It would not be until 1 March that Corregidor and the outstanding harbor would be open to Allied shipping. The Japanese estimated that they had approximately 6,700 of their army on the island. Only 50 survived, 19 were taken prisoner and 20 stragglers surfaced in January of 1946. 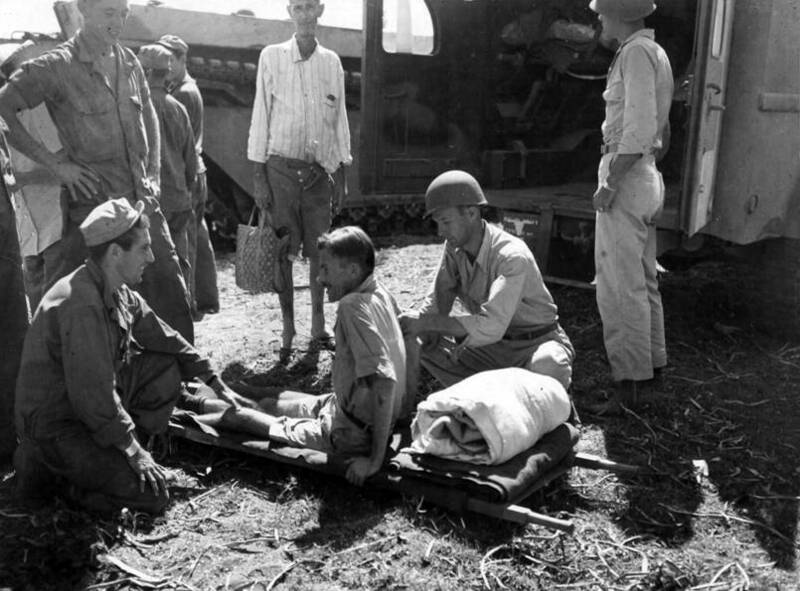 U.S. casualties were 136 with 531 wounded and 8 missing. 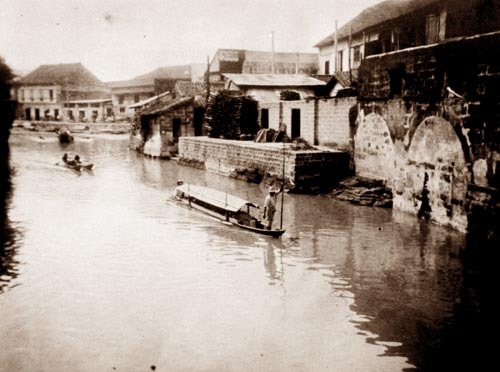 While the 511th regiment was held up at the Paranaque River, the 674th regiment moved in to assist them. 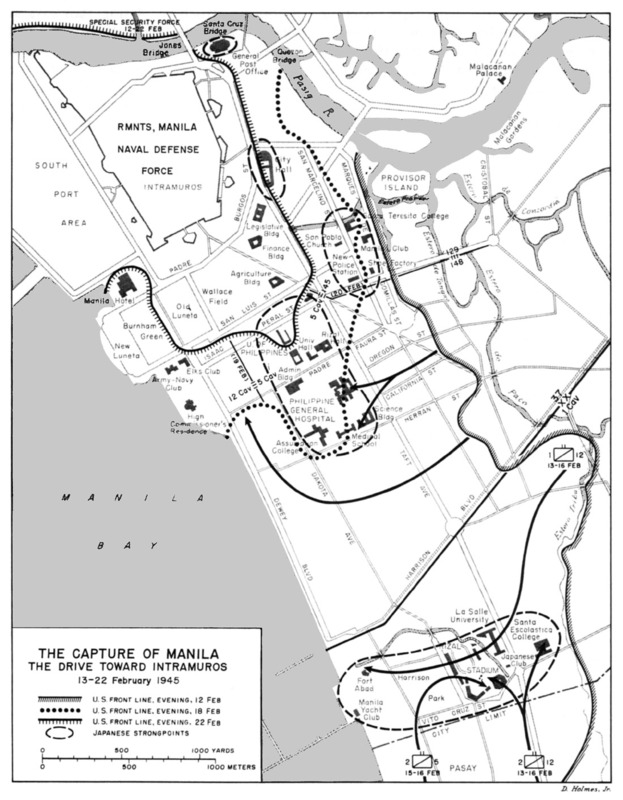 The evening of 4 February 1945, the smoke and flames inside the city of Manila could easily be seen. 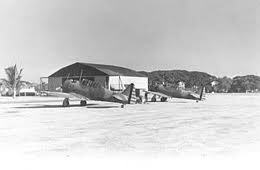 The Japanese Naval Air Service was stationed at Nichols Field where they had antiaircraft weapons that would shoot at the American planes overhead or positioned to aim directly at the troopers on land. The enemy 4th Naval Battalion had secured Fort McKinley and other Japanese units filled in the gaps in between. 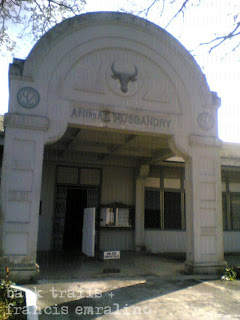 On 7 February, the 188th reg. and the 2d battalion of the 187th headed across open terrain toward Nichols Field where they encountered tremendous resistance. It would take four days to create a solid defensive line diagonally across the air field. On this date, a member of the 511th would make contact with a patrol of the 1st Calvary near the Philippines Racing Club, but the Japanese were still defending Nichols Field complex, the center of the Genko Line, as though they were protecting the Emperor himself. At this time, the 2d of the 187th was attached to the 511th. 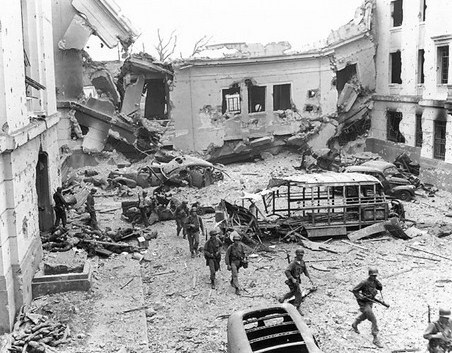 The CP (Command Post) was in a spanish-style house with a wall surrounding it, and it was receiving 20mm AA fire. One shell went through a window and killed Colonel Haugen (C.O. of the 511th), but Gen. Swing, Col. Tipton and Capt. Barker were unharmed. By 12 February, enough was enough. Swing sent the 2d of the 187th to attack Nichols Field eastward, while the 188th and the 1st of the 187th drove in from the south. 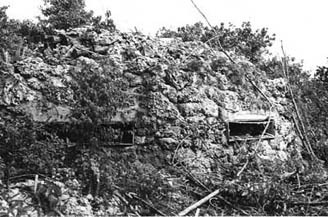 Under continuous fire, they attacked the enemy pillboxes and emplacements. The enemy’s fierce counterattack was repelled and most of the field was in U.S. hands by dusk. They did need to continue fighting throughout the following day. By the time Valentine’s Day rolled around, the 188th and the 2d of the 187th turned toward Fort McKinley. Gen. Eichelberger felt that the results were “one of the most daring feats of the war” being that there were only seven infantry battalions in the entire division. There was also no rest for the weary, even the truck drivers were running supplies 19 hours a day and Gen. Swing used a cub plane to land and see what was happening at the front lines. Dad always said that it was an everyday occurence to have Swing on the point. And now, the 457th regiment was in position on Tagatay Ridge to provide support for the MSR (Main Supply Route). current news – A 16 year old French boy found a WWII duffel bag in his grandfather’s attic and returned it to 92 year old Army veteran, William Kadar in Indiana. Kadar last saw the bag in Nov. 1944 – one week before the Germans captured him. Also, in a town just a few miles from me, 20 WWII veterans of WWII received France’s Legion of Honor Medal. Anyone who served in France during the war is eligible to apply for this. Remember to click on photos for a larger view. I recall my mom “double-dutch” jumping rope and my dad describing “kick-the-can” as a soccer/tag “you’re “It” sort of game and singing a cappella with your buddies in “Jersey Boys” style and he could still hit the high notes later in life using a falsetto voice. As Judy said, let us know how your family recall those times. Personal note – correction for “Enemy they faced” post of mine. http://www.allworldwars.com/Japanese-in-Battle.html, very sorry. I’ve invited gpcox to share another post with us. This one concerns the life of an American Family during the 1940’s. I learned a few things myself. 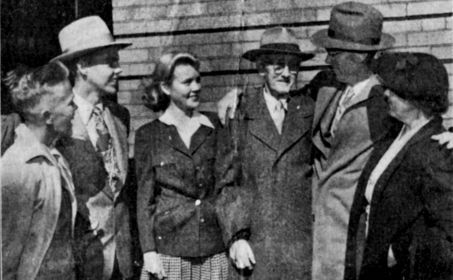 Judy’s collection of letters from her grandfather is an excellent example of what the American family endured during the Second World War. 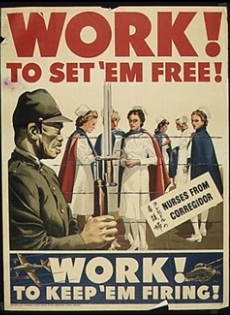 With the onset of war, patriotism certainly skyrocketed as well as marriages, job opportunities and salaries. But here, fresh out of the depression, poverty, divorce and taxes soared. Twenty million people bordered on starvation. There was a shortage of shelters, hospitals and child care facilities. Many youngsters quit their education to help support the family.